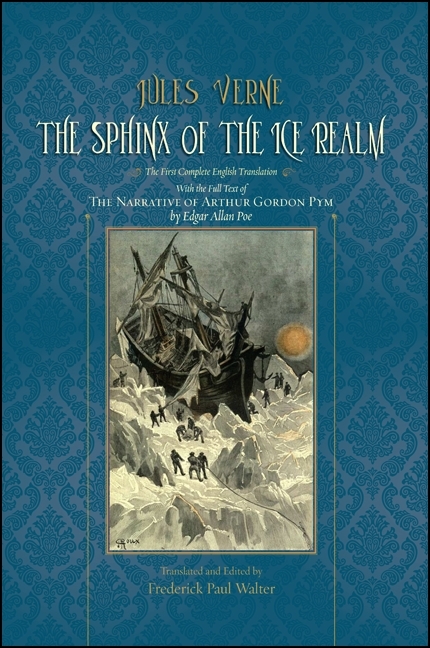 Edgar Allan Poe’s telling of Arthur Pym’s narrative is shown to be true as events come together that bring out clues that help Captain Len Guy trace the fate of his brother’s ship the Jane; the very ship that Arthur Pym was on board at the time of his disappearance. Through the efforts of Mr. Joerling, the crew of the Halbrane is enticed to make the trip to Antarctica to search for any survivors of the Jane. NOTE: Verne wrote story as a sequel to Edgar Allan Poe’s book The Narrative of Arthur Gordon Pym . Poe was one of Verne’s favorite authors. In 1864 he wrote an essay discussing Poe’s work. Translator & Editor: Frederick Paul Walter. Albany, NY: SUNY Press, 2012. 435 pages. some illus. In 1864 Jules Verne wrote an essay on Edgar Allan Poe and his works, in the fourth chapter he covers Poe’s only novel “The Narrative of Arthur Gordon Pym of Nantucket.” In this chapter Verne talks about Poe’s ending of the novel, which left the reader wondering what happened to Pym. Pym dies before giving the editor (Poe) the final chapters of his story. Verne asks “Who will ever take it up again? Somebody more daring than I am,….” Thirty-three years later Verne himself rose to the challenge with the publication of this tale. As Verne was a fan of Poe’s works, having read only the French translations, such as Charles Baudelaire’s translation of Pym, it only seemed natural that he himself would do it. This might be one of the earliest examples of “fanfic” (fan fiction). The story itself is good, Verne plausibly brings a conclusion to the story in his own style. The edition that contains this story is excellent. The translator and editor Frederick Paul Walter has provided a fresh and complete translation of Verne’s story and also included is Poe’s original tale, so if one hasn’t read it before now they have the opportunity. Also included is a fresh translation of chapter 4 of Verne’s essay on a Poe, a piece on translating Verne, recommend readings and textual notes to satisfy any scholar. -- Review by Dennis Kytasaari, originally published on Goodreads.com.